For the first time all season, the St. Helens wrestling team had no outside responsibilities, no novice meets, no youth tournaments to run, and no school finals to take. This week, before the dawn of the Northwest Oregon Conference district tournament, the Lions were able to lock in on practicing harder and harder each day in preparation for their biggest meet so far this season. Individual strengths were polished. Best moves were tweaked. Strategy was discussed. For some St. Helens competitors, district success means winning a match or two. For others, it means winning their weight class and standing atop the podium on Saturday night at Scappoose High. Whatever comes, the Lions are well-equipped after a markedly improved regular season on all sorts of levels. This is what the Lions have worked for all season, dating to the first practice. "With our kids being so young, the biggest thing we try to instill is confidence," St. Helens coach Greg Gadbois said. "Have confidence in yourself, your teammates. Know what you're capable of and do it. "We have a lot of kids who have never been in this situation. Some kids are new to being good. Some are new to success. And sometimes that's hard for 15-, 16-, 17-year-old kids to grasp. We want them to fully appreciate how good they can be, go out there carefree and wrestle to the best of their ability." The district tournament begins Friday at Scappoose. The NWOC semifinals will start at about 10 a.m. Saturday. The finals are Saturday evening. Those who survive into Saturday typically place in the district. Four wrestlers in each weight class earn spots in the Class 5A state championships Feb. 22-23 at Veterans Memorial Coliseum. 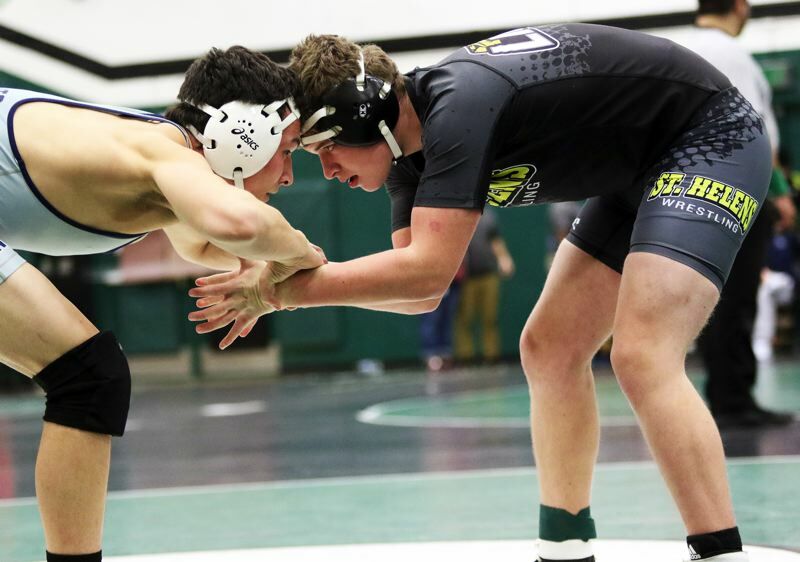 St. Helens standouts such as Narcizo Garza, Tristin Buchanan, Ryan Burri, Mavrick Rask, Dylan Scott and Rachawn Lee have done the lions' share of the heavy lifting to put themselves in position to qualify for state. Burri, at 170 pounds, is St. Helens' lone state returner. Garza has been a revelation as a freshman, with his only losses coming at the hands of previous state placers, including a last-second defeat by Scappoose's AJ DeGrande. Buchanan and Rask barely missed the state meet last year. The Lions have 25 wrestlers scheduled to compete at the district meet — the largest contingent among the NWOC field. The St. Helens program has filled out in numbers through meticulous recruiting and cultivation of the youth program under Gadbois' watchful eye over the years. Soon, maybe even this weekend, the Lions will reap significant district rewards from that. Gadbois said he has no expectations regarding the team standings other than he wants each Lion to peak. "Winning or losing won't define our success," Gadbois said. "Even a guy that loses twice could have the best tournament of his life. Our coaching staff and the kids will know at the end of the meet whether they wrestled to the best of their abilities or not."